USA (MNN) — Islamic State is taking lives in the most barbaric ways. Beheading Christians, burning people alive, selling the organs of those they capture, and selling young girls to the highest bidder. Why are they doing this? It’s not because these individuals have offended them, have attacked them, or threatened them. They’re being attacked because members of these terrorist groups want everyone in the world to bow to them and their god. I’ve heard some pretty outlandish things. First, a U-S State Department spokeswoman Marie Harf told one news network that the west needs to go after the root causes that leads people to join groups like ISIS and Boko Haram. She says if we could improve the governance of their countries, improve the grievance process, and provide job opportunities that would address the problem. Following the three day White House Summit on Violent Extremism, President Barak Obama said the world needs to end the cycle of hate by expanding human rights, religious tolerance and peaceful dialogue. He also suggests that Western nations must show that they “welcome people of all faiths,” at a time when “extremists” are saying that Western nations are “hostile to Muslims. I do believe both of these individuals have a point, but not what you think. First, let me address Marie Hart’s comments. She’s right, we need to address the root of the problem to fix the ISIS problem. But, the root problem isn’t the lack of jobs, or poverty. If that was the case India would be the home of great bands of terrorists and the homeless in the United States would be nothing more than urban terrorist thugs. The key to getting at the root cause is seeing what is at the heart of this issue — evil hearts. What do I mean? Man without Christ is evil. As we look at these world events, the only thing that can describe the problem is that it’s utter evil. Where does that come from? A person who is separated from Christ. Satan is the master of using evil to accomplish his purposes. Secondly, I believe President Obama is correct also, but his assessment is a bit off. I believe we should do more than just bomb the Muslim terrorists and and leave. I think as Christians we have a responsibility to do something for these people. But the first thing we need to do is to tell them about Jesus. When the Bible says, “For we do not wrestle against flesh and blood, but against spiritual wickedness in high places,” we now see what that’s like first hand. We’re seeing people who are blinded by the faith of ‘another gospel.’ We’re seeing people who are searching for truth, only being blinded by the lack of truth taught by a book that’s not God’s spoken Word. So, what’s the answer? I believe the answer is to start praying for Muslims to see and understand who Jesus is. Many Muslims believe Jesus is a Holy Prophet. Because of that, Christians need to leverage that. If they believe He is holy, why don’t they know more about Him. How will they learn more about Him? By reading the Gospel. How will they read the Gospel if they don’t have access to it. Today, Muslims can access Scripture in more ways than ever before. They can access it in text on websites in their own language (https://www.biblegateway.com/versions/). It’s also available to people who would rather listen to it (http://www.bible.is/). What’s the bottom line? Only Christ can change the ISIS problem. Only God can limit the evil man does to each other. Only God changes hearts. Pray earnestly every day that God will do this in the hearts of Islamic State terrorists and others who don’t know they Savior. Have you participated in the 30-Days of Prayer for the Muslim World? Since 1993, the 30 Days of Prayer for the Muslim World Prayer Guide has been offered to help Christians learn about and prayer for Muslims during their most holiest month — Ramadan. Many of those years, Mission Network News has offer the resource to our friends. Perhaps you’ve received one. I’d like to ask you a question: Did you like the prayer guide? If you did, how did it help you? Did it make praying for Muslims easier? Did the information provided in the guide open your eyes to their needs? Also, how as MNN helped you in this process? Here’s your chance to tell us about your experience and encourage fellow Christians to get their own copy so they can pray more effectively. Write as much as you’d like in the space provided below. Perhaps we’ll use some your comments in an Mission Network News story in the days ahead. Thanks in advance for your help in this effort. Mission Network News has learned that there is a growing conflict between Russian evangelical Christians and Ukrainian evangelical Christians. The accusations between the two sides are astounding. On March 9, Dr. William Yoder (no relationship to me, that I know of) wrote an article and commentary about the schism between the two. Unfortunately, he sided with the Russian pro-Putin church. I’ve decided to give equal time to Ukrainian evangelical church who are in the cross-hairs of Yoder. Here is the response to Yoder’s accusations. Ukrainian Christians believe some Russian Christians are aligning themselves with pro-Putin radicals in Russia. Russian Christians are accusing Ukrainian Christians be being ultra-nationalist revolutionaries. Dr. William Yoder, representing the interests of the Russian Baptist Union, came to the defense of Russian policy regarding Ukraine. In his mailing on March 18th, 2014 he criticized the Ukrainian Maidan protesters and their defenders for not being democratic enough, and not waiting for the next elections, but instead seizing power and provoking the secession of the Crimea. Additionally, Yoder compares Ukraine’s claims to the Crimea to a former spouse, who was never actually legally married, but after splitting up claims a right to the other’s belongings. Crimea was given away by Khruschev illegally in 1954, therefore no one owes Ukraine anything. Justifying Russia’s aggression towards Ukraine, Yoder criticizes Ukrainian church leaders who have come to the defense of the territorial integrity and sovereignty of their country. He corrects of the vice president of the Ukrainian Baptist Union, Valery Antonyuk, and states that Kiev Protestants have no right to talk about their country’s integrity because the eastern part of the country wants to be part of Russia. He also commented on the “illegal” interim government of Ukraine and acting president Oleksandr Turchynov, a Baptist, who is supposedly hurting the reputation of Baptists in Russia. William Yoder defends Yanukovych’s regime from accusations of cruelty by saying, “Was Yanukovich’s administration more despicable than Cambodia’s Khmer Rouge?” It seems that all regimes any less despicable than the Khmer Rouge must be acknowledged as fully democratic. 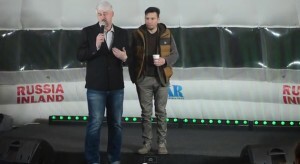 But the height of cynicism from Yoder’s side was his criticism of a Christian organization for supporting the family of Alexander Khropachenko, who was killed by a sniper on the Maidan. Yoder believes that this is evidence of one-sided sympathies. Yoder suggests equal assistance for the families of police who lost their lives (who killed over 100 Maidan activists and injured hundreds more), in order to show a non-partisan and peacemaking front. And because some of the ministry’s leaders took a clear stand on the side of the unarmed protesters instead of the armed killers, Yoder accused them of criticism of Russia and anti-Russian viewpoints. However there is a distinction between disagreement between Russia’s policy, which is natural for the civilized world, and truly unacceptable Russophobia. The commentary of Dr. William Yoder is a mix of naïve faith in the authority of Russia, loyalty to his employers, and lack of understanding in the sphere of politics, history, and culture. You cannot talk about peacemaking while avoiding the truth and failing to distinguish between the aggressor and the victim, right and wrong. Peace can only be achieved after truth – acknowledgement of and repentance from crimes committed. Therefore the comments of William Yoder should have begun with an acknowledgement of the obvious fact of Russian intervention, without which everything written is a manipulation of facts. But what is even more noticeable and sad is his lack of empathy and sympathy for the tragic events in Ukraine. It is a bad sign – without empathy you cannot hope to come to the truth, let alone achieve peace. Ukraine (MNN) — I have been watching with dismay the situation in Ukraine. The ouster of the government, now the Russian troops that have invaded Crimea, and now an illegal referendum vote, have left the region in chaos. This is Ukraine in crisis. It reminds me a little of the Cold War days when the Soviet Union would do things that were only in their interests, not the interests of the people. This situation, though, could have serious repercussions for the world both politically and spiritually. How? Let’s talk about the political side first. Ukraine is wrestling with a new government that has basically divided the country. The pro-Ukrainian side appears to outnumber the pro-Russia side. Unfortunately that divide could cause the country to lose a portion of a treasured region, Crimea. This pro-Russian mindset may be the spark of sussession. Ukraine is mobilizing troops to try and defend its sovereignty, but they don’t stand a chance. That leads to other questions. If Ukraine attempts to defend itself, will it ask for help from the United States and he European Union? If those nations respond, will China get involved? If the United States assists Ukraine, what will that mean for the future of USA/Russian relations? If the United States and the EU are asked to help and they don’t, what kind of message are we sending to the rest of the world? Is it a sign of weakness? Is is a sign of disinterest? Will Ukraine ultimately fall into Russian hands, creating another Soviet-like state? If the U.S. doesn’t respond, will this be the end of U.S. Influence in the region? Will Russia continue it’s invasion into Ukraine, eventually taking over the entire country? On the spiritual side, the crisis in Ukraine is creating an uncertainty that this generation in Ukraine hasn’t seen before. Openness to the Gospel has never been better. 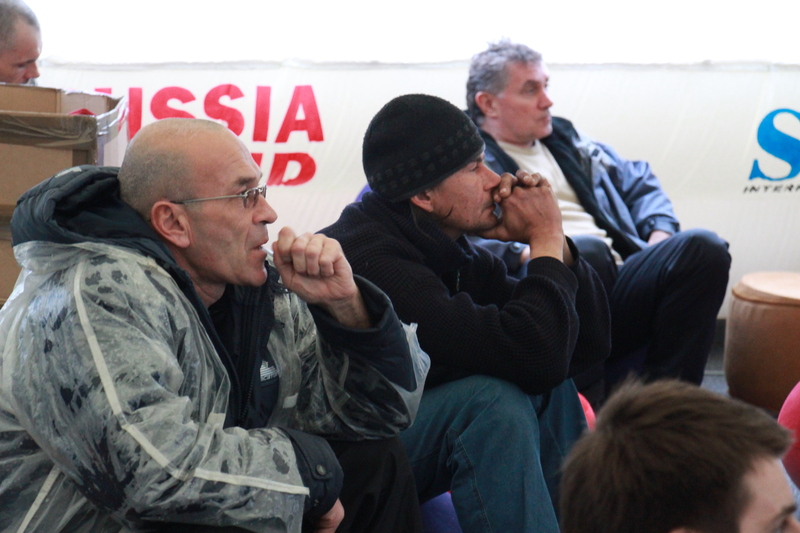 Russia has a similar openness, which I witnessed while I was in Russia this past week. Will the strained relations between Russia and the U.S. prevent American Christians from being able to go to Russia to help people understand the Gospel? Will short-term mission trips to socially needy parts of the country end? 1. Pray that Russia will leave Crimea and that peace would be restored to a sovereign nation. 2. 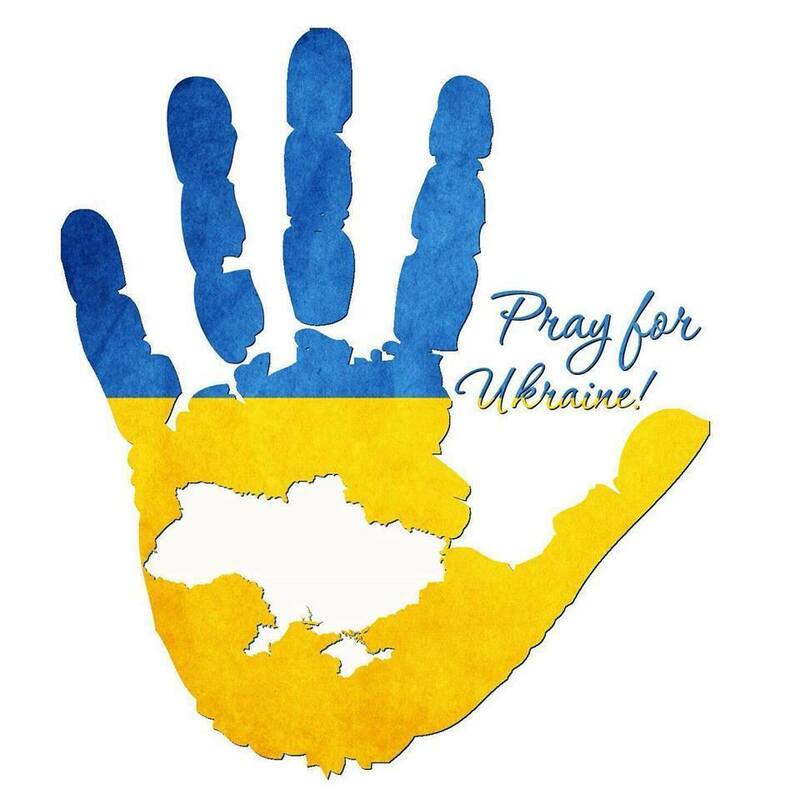 Pray the newly appointed Ukrainian government will be given wisdom from God to be able to handle this difficult situation. 3. Pray that God would use this uncertainty to help Christians share the certainty that can only come though the Gospel. 4. Pray that the EU and the USA would be used by God to help the situation end it peace. 5. Pray each nation’s leadership would be given divine inspiration on what they should do. 6. Pray that God would use this crisis to lead entire cities and communities to Christ. 7. Pray that planned ministries would be allowed to move forward despite the uncertainty. While these are the requests of men, pray that these requests are also the desires of our Might And Holy God. Mission Network News will continue to cover the unfolding situation in Ukraine, including the Crimean Penninsula. Olympic Park – Sochi, Russia (photo by Greg Yoder). 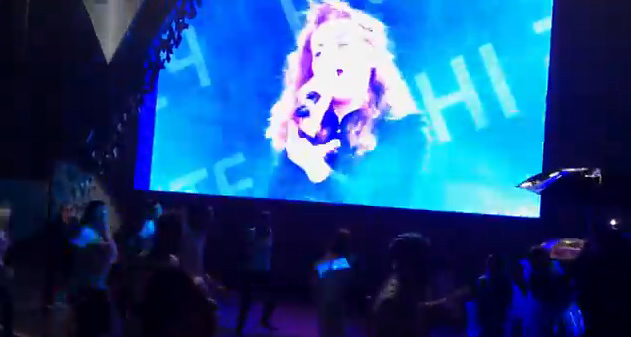 Russia (MNN) — We only have one day left in Sochi, Russia and the church Fun Zone. I wasn’t able to update this blog until this morning, so let me give you an update over the last three days. On Saturday, a few of us traveled to Olympic Park to watch an Olympic event. Curling. The trip to Olympic Park is great. It’s a brand new electric train. It’s free to help get spectators to and from events. As you get closer and closer to the events, the excitement grows. By the time you arrive on the 30 minute journey, you’re ready to almost run to where you’re going. Except, you don’t realize how FAR you have to walk. It’s a haul. It’s got to be over a mile. Vicki Adams Curler for Great Britain (photo by: Greg Yoder). We walked to the IceHouse, the home of the Curling event. We thought the USA was playing in the three team event, but they weren’t. But, it was a great time. 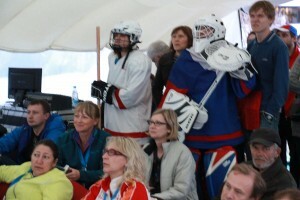 We sat next to Gordon and Kate Adams, the parents of Vicki Adams, a team member of team Great Britain’s Curling team. We didn’t know any of the rules or strategy surrounding the game. The Adam’s were very gracious in explaining them and event encouraged us to cheer for her daughter. The Great Britain team won on the final stone. It was actually exciting, especially as we watched the parents get nervous for their daughter. We spent a little more time in Olympic Park. The areas features the ‘Fun Houses’ of Switzerland, Russia, Canada, United States and more (I’m sure). But, unfortunately an invitation is required for the most of the Fun Houses. It was a little disappointing. 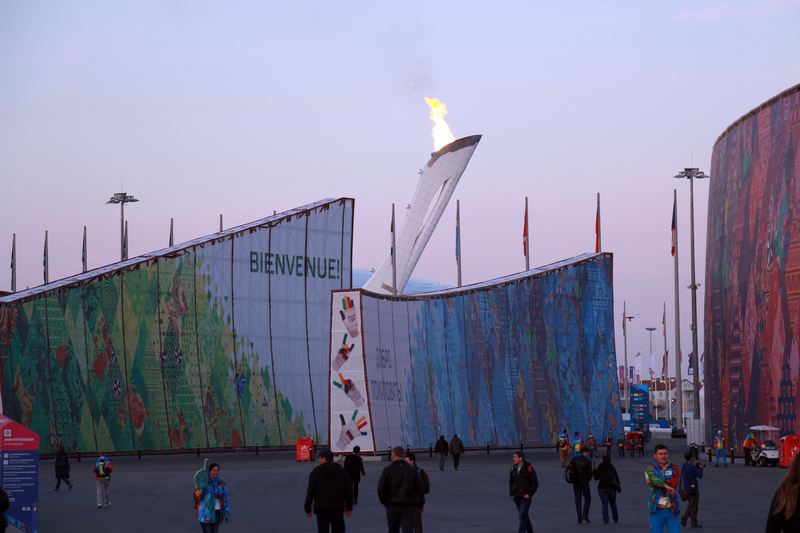 Coke had and exposition and so did Korea, the host of the 2018 Winter Games. I’ll tell you about that later. Russian fans watching the USA vs Russia hockey game in the Fun Zone (photo by Greg Yoder). Following our time in Olympic Park we traveled back to the Fun Zone. Why in the evening? It was the USA vs Russia hockey game. It was a fun rivalry. The Russians were talking ‘smack’ with us. We were gracious (most of us were). One person wanted to bet 100 rubles. I told him it’s not that important, besides he would lose. So, we shook on it and watched the game together. It was a back and forth contest that could have gone either way. But, the Americans prevailed. The whole Russian crowd was disappointed. However, we waved our American flags very proudly. 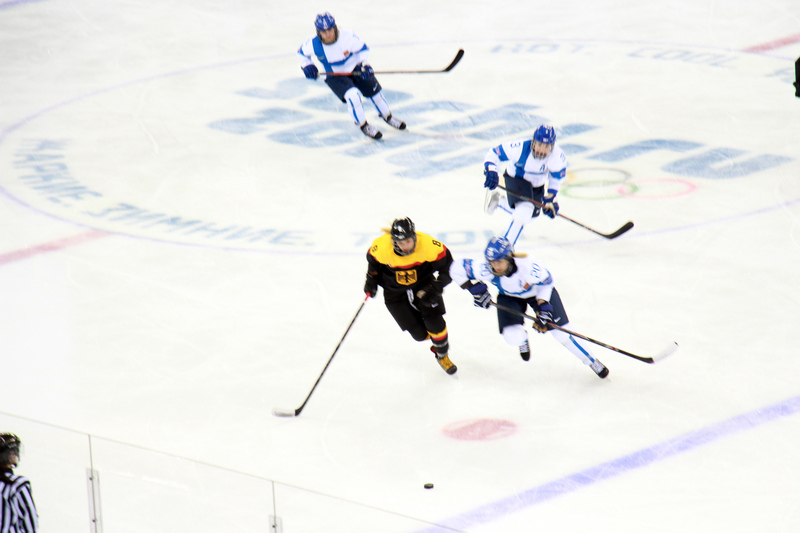 Germany vs Finland in women’s hockey (photo by Greg Yoder). On Sunday, Feburary 16th a number of us had tickets to the Germany vs Finland women’s hockey game. I must tell you that we were looking more forward to being able to walk through Olympic Park, rather than watching women’s hockey. After watching so much men’s hockey, I think I’m spoiled. While we watched closely, the speed of the game is much slower and the skill is much less than the men. 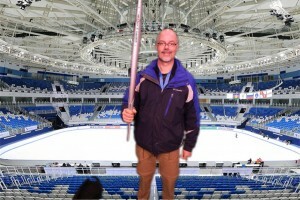 It was fun to be a part of the Olympics event, but the level of hockey wasn’t really there for me. Finland won 2-1. Greg’s Coke endorsement with the Olympic torch. We spent almost all day in Olympic Park. We knew that would probably be the last day our team would be able to soak it all in. So, we went to Korea’s Fan House. There, they showed us the dream for the Olympics of 2018. Hopefully they’ll be able to get everything done in time, unlike Sochi. After that, we stood in line for the Coke experience. It was two huge blow-up buildings. It was basically a coke informercial, which culminated with a free bottle of coke in a special commemorative aluminum bottle. Following that, we traveled back for dinner at the hostel. Russian Ministries’ Wally Kulakoff with SOAR International’s Richard Page at the Fun Zone in Sochi (photo by Greg Yoder). On Monday, it was a time of ministry. I spent most of my morning writing, waiting to see my friends at Russian Ministries. They were to arrive at the Fun Zone when it opened at 3:00 pm. I arrived just prior to the opening, but the bus ride to the church was interesting. Our group of four got on the bus. About four stops in the four people got on the bus. They were speaking broken English. One of them looked around the bus and spotted me, an obvious American. He sat next to me on the bus and started talking to me in Russian. I couldn’t understand him very well, so I told him so. Then he acted like he couldn’t understand me (in English). He asked me where I was from — specifically. 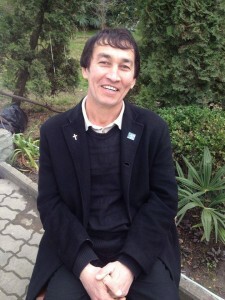 When I asked him he said, “Chechnya — Grozny.” That made me a little nervous. But, what happened after that REALLY made me nervous. All four of the people got their Ipads, Iphones and other electronics out and started acting very aggressively. Unbeknownst to each other, we were all feeling VERY uncomfortable. So, our Russian translator said, “Let’s go.” It wasn’t our stop, but we all got up and got off the bus a few stops early. As we got off, we all said, “That just didn’t feel right.” After we got off the bus and made it to the Fun Zone, we were pulled aside by our hosts that the secret police informed them that a high terror alert was issued. We felt good that we listened to our instincts. 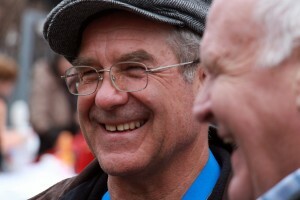 Russian Ministries Team Gennady Tarkun and Pavel Tokachuk (photo by Greg Yoder). Many people attended the Fun Zone Sunday. In an interview with Wally Kulakoff, he told us about their 11 city marathon, sharing the Gospel in 11 cities during the Olympics. This was one of their stops. I’ll tell you more about that in our special report Wednesday. It has been a wonderful experience being here in Sochi for the Olympics. Keep praying. SOAR International Ministries is helping to support the ministry. They still have a week to go and they need funding to help keep it going. Because of the excitement and popularity of the Fun Zone, they’re running a little over-budget. Could you help support them? Go here: http://www.SOARinternational.org. 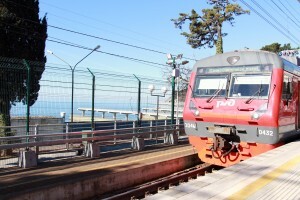 Taking the train to the Mountain Cluster events at Sochi. 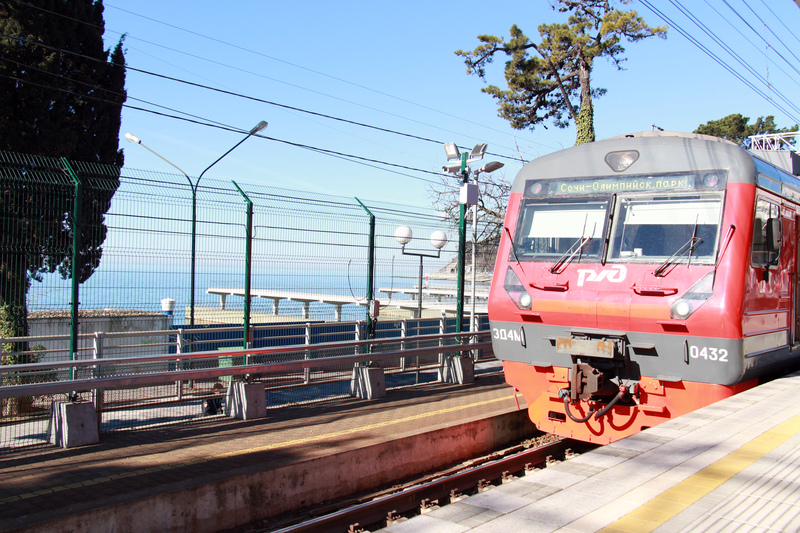 Sochi, Russia (MNN) — Day one is under my belt and the Winter Olympics are so different than what you are seeing on television. While the beautiful picture you’re seeing on television is beautiful. The snow, which is beautiful where there IS snow, but there IS not snow in much of Sochi. Thursday, February 13 I started off on the train. Richard, Anya, John, and I traveled to what’s called the mountain cluster, where the ski events and bobsled competition are taking place.The rest of the team went to the City Center ‘Fun Zone’ to actually work with the kids and adult visiting the center. 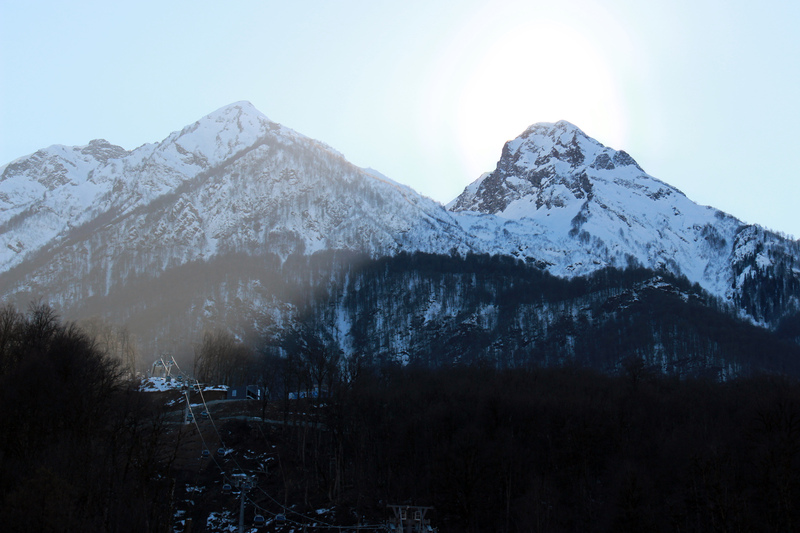 The mountains around the Mountain Cluster at the Winter Olympics in Sochi, Russia. Yesterday in the mountains, it was 60 degrees. It was amazingly warm. As long as the sun was out, we were warm. But, as soon as the sun fell behind the clouds or the mountains, it got chilly — but not cold. In the morning, we spent most of the time just taking in the atmosphere. Since the ‘Fun Zone’ didn’t open until 3, we were able to take video, conduct interviews with church members and spent some time being the subject of interviews from CBS News and Russian TV. We were eating lunch at McDonalds, we were approached by a Russian translator from CBS News. She said they were looking for Americans, but they were hard to find. It was probably because the U.S. media did such a good job scaring away the American public. At any rate, they asked if we would be willing to answer some questions. We agreed. It was fun. We were asked about everything from why we were there, what sports we enjoy (my response was hockey), and why we were there. John told them he love curling. He was so animated. He’s probably going to be on TV. Teen girls enjoy the fun zone in the mountain cluster. After our time there, we went to the fun zone. It was a small place connected to the local church. But local kids were very involved in it. They had a trampoline, a blow-up room, and lots of games and interaction with adults. It was a great opportunity to have fun with the kids. Since this is a battle against flesh and blood, but against spiritual wickedness, I found out that our producer (who was filling in for me while I’m in Russia) got the flu. So, I had to head back to City Center to anchor our news broadcast. But, before that I was able to do an interview with Richard Page, John Rysdyck, and other members of the team about what they were going at the ‘Fun Zones.’ That became the story for Mission Network News. Friday, the whole team is heading to the City Center ‘Fun Zone’ to spend time with visitors both children and adults. Saturday, I’ll be heading to an actual event. CURLING. Unfortunately, I was able to attend my event Thursday because of the emergency at work, but I’m looking forward to that, and watching the U.S.A. vs Russia hockey game in the City Center main screen. It’ll be fun interacting with the Russian during the game. Pray for us! I’m battling sleep deprivation because of a snorer in our room. 🙂 Pray that I’ll avoid getting sick and that I would be able to get my work done. But, more importantly, pray that the stories I write will be the stories God will use to call His people to his service. While the 2014 Winter Olympics are already underway, I am waiting patiently for my flight to leave. Yes, I am leaving for the Winter Olympics on February 11 to catch up with Russian and American Christians who are working together to love those who are in Sochi. 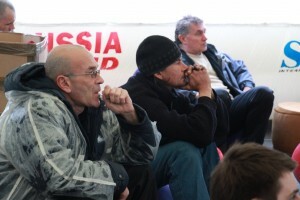 This is a grass roots ministry effort spearheaded by the Russia Inland Mission, support by SOAR International based in Alaska. What’s the ministry? They have open three hospitality centers in three areas. Each center will have viewing centers, but will also provide entertainment and interaction with those who venture in. The goal is to begin relationships that open doors to eventually share Christ. Beginning February 13, I’ll begin covering the outreach events at the centers. I’ll be interviewing local Christians,national ministry leaders, participants and maybe even athletes about their involvement. I’ll also look behind the scenes to get unique stories about God’s work at the Olympics. I’ll be featuring stories for radio, video and here on this blog every day between February 13-19. 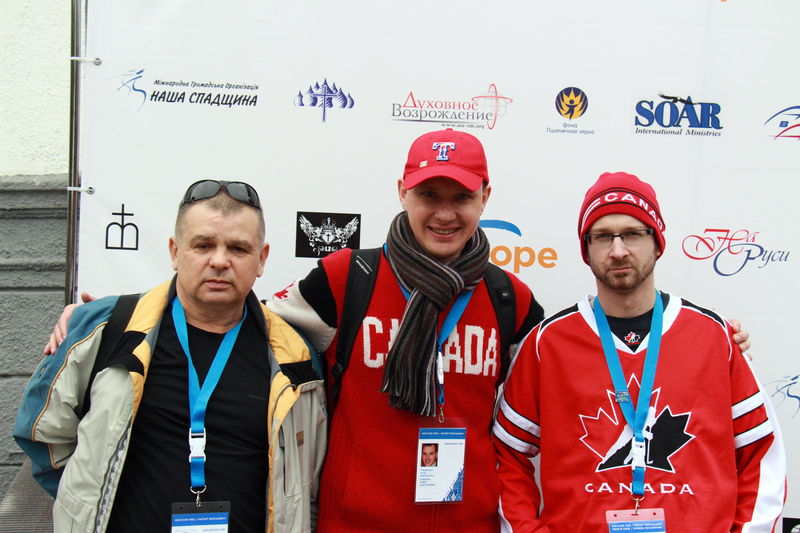 Unfortunately I will not be there for the entire Winter Games, but I’m looking forward to rubbing shoulders with my brothers and sisters who are sharing their faith in Sochi. It has been long in coming. 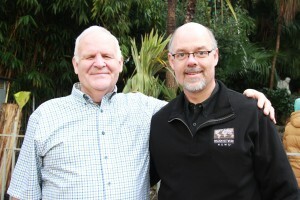 Mission Network News, after more than a year, has a new website. It hasn’t come with out a little pain. We’re still dealing with some of it, but we’re excited about what will be able to do through it. I wanted to take some time to tell you what’s new about this website. First, the design is totally different. 2005 was the last time we redesigned our website. This website is more appealing to the eye, but it will also allow us to provide you with breaking news easily. Also, each story gives you an opportunity to interact. You can leave comments and share each story on your favorite social media outlet. Also, in each story we can use all kinds of media to tell the story including photos, video and audio. Another update is the Mission Network News daily and weekly email news and prayer updates. The last time this service was updated was in 2005. The backbone of the service had roots to 1997 technology. It’s amazing that it served us as long as it did without any issues. The new service will allow us to be more effective in the way we not only send our email, but how we recruit new subscribers. The new website hasn’t come without challenges. We completely renamed everything on our website, so Google is going to take some time catching up to our file system. You can help us. If you have a Google+ account, when you post links to your page, you’ll encourage Google to re-index our website, which will help us in search engine referrals. No website is perfect. But, we believe with you help we can make it a missions website that will motivate ordinary people like you and me to tell an extraordinary message of Jesus Christ.